GPC Column Terminology: What does it mean? 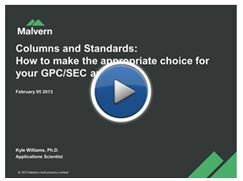 With a variety to choose from, selecting the correct columns for your GPC/SEC application can be challenging. Making the choice even more difficult can be the terminology used to describe different column types. In this post we’ll discuss each column type and explain its name. Most of the figures in this post have been extracted from Malvern’s webinar on the topic, which provides an in-depth look at each column type and specific column considerations. With this information you will be well on your way to a successful GPC/SEC analysis! The two main classes of analytical GPC/SEC columns are described as single-pore size columns and mixed-bed columns. 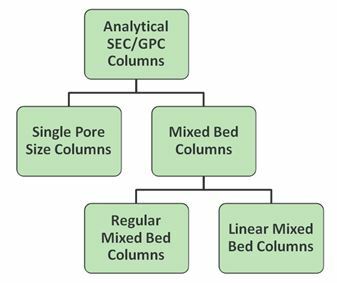 As will be discussed below, there are two different types of mixed-bed columns. The hierarchy of analytical SEC/GPC column classification can be described by the following chart. Single pore size columns contain gel that is designed to provide maximum separation over a relatively narrow molecular size range. These columns are best used when analyzing similar materials repeatedly, such as a QA/QC environment, where the user has some knowledge of the samples and understands the molecular size range of the column is appropriate for the samples. As the molecular size coverage of one particular type of single pore size column is relatively narrow, a series of single pore size columns exist. Malvern designates the organic versions of these columns as T-1000, T-2000, T-3000, etc. up through T-6000 (or A-1000, etc. for aqueous equivalents). A representation of the molecular size ranges of these columns is shown in the following figure; the shapes of the calibration curves have been exaggerated for demonstration purposes. A mixed bed column contains gel with different pore sizes which means the column can separate over a broader molecular size range. It’s like a mixed bed column contains a bunch of small single pore size columns in series. The main advantage of mixed bed columns are that they can analyze materials within a large molecular size range, which is ideal when analyzing unknown samples. The disadvantage to mixed bed columns is that the column contains less resolution for any one particular molecular size range than the single pore size columns. However, when two or more mixed bed columns are used in series, good resolution over a wide molecular size range is achievable. As shown above, there are two types of mixed bed columns: regular mixed bed and linear mixed bed. Both contain gel with different pore sizes; the difference is in the ratio of the pore sizes. Regular mixed bed columns are designed so that they’re calibration curve is steeper at the extremes and flatter in the middle, creating a sweet spot which contains higher resolution than at the extremes. Linear mixed bed columns are designed so that they’re calibration curve is linear, providing equal resolution over the entire molecular size range. 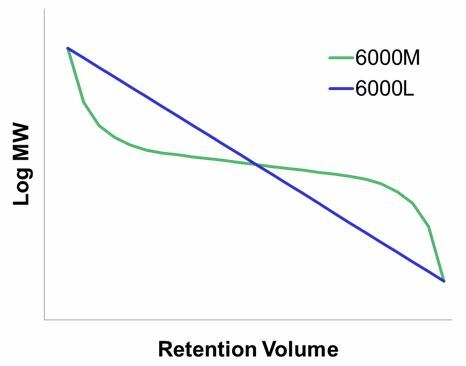 Examples of a calibration curve from a regular mixed bed column (6000M) and a linear mixed bed column (6000L) are compared in the figure below. It should be noted that these curves are exaggerated for demonstration purposes. In reality, the two curves are much more similar. Malvern designates regular mixed bed columns with an “M,” such as the 6000M above. This is one of the more popular columns, as both organic (T-6000M) and aqueous (A-6000M) versions exist. The linear mixed bed columns are available only in the organic variant, and are identified with an “L,” such as the 6000L above. The full name of this linear mixed bed column is LT-6000L, where the L (both of them) stands for “linear” and the T represents the general organic classification of the column. Differentiating between these terminologies is most important when choosing which columns to use. Specifically, when determining which columns to combine to create the best column set for your samples. While it is true that one can combine several single pore columns to create an extended-range column set, in practice, it is much easier to combine mixed bed columns. When combining single pore columns, one must be careful not to create pore mismatching which can result in non-smooth calibration curves (which can then cause unexplained bumps in your sample chromatograms). 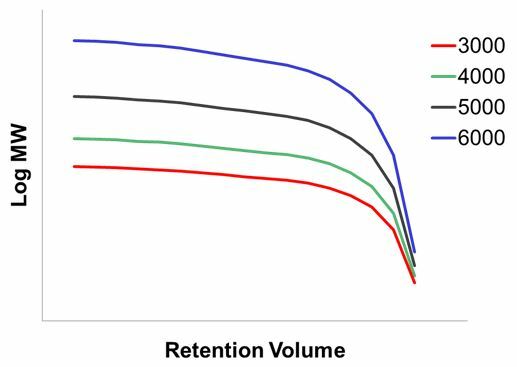 Besides combining different pores to extend size range, a frequent practice is to link two or three of the same columns together to improve resolution within a specific narrow MW range. Since mixed bed columns contain gel with different pore sizes, there is usually some gel overlap which causes the resulting calibration curves to be smoother. The best results are obtained when combining one mixed bed column (regular or linear) with the same type column. Whatever type of samples you’re analyzing, Malvern provides a variety of column options to meet your chromatographic needs, from general organic and aqueous columns to protein and specialty columns. Good luck! Acknowledgement: Thanks go to Kyle Williams for contributing this article.